Welcome to the home of UTM Revolution 002. We are a group of U19 athletes participating in the Tier 2 division of PWSA for 2019. We are a first year U19 club, with all of our athletes being born in 2002. We are hopeful that our group can stay together for a couple of years and grow together into one of the better teams in this division in Ontario. Our team is led by head coach Jason Saker. Our home location is the Guelph/Morriston area. In addition to tournaments our team will also participate in the U19 Grand Valley Ladies Softball League. Our athletes are listed below. We are excited for the upcoming season. Up the Middle (UTM) Fastpitch is a growing sports organization located in Ontario Canada. We provide news & information for players, coaches, and fans of the sport of softball. Our website was first launched in 2014, and we have expanded the content each subsequent year. We also operate our own branded teams known as UTM Revolution. 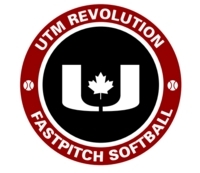 Founded in 2016 UTM Revolution teams compete in the Provincial Women’s Softball Association (PWSA). We are proud to be a partner of Rawlings Softball Canada. © 2019 UTM Fastpitch. All rights reserved.